On this blog, I always promise that if I make a recipe that turns out to be a failure, I will include the results here. My first batch of macarons à l’Ancienne were a flat pancake of a disaster, but for once, it wasn’t my fault. Last week was pretty hectic for me, so I decided to bake something that I thought would be simple. A recipe with 5 ingredients (all of which I had in the cupboard) and a 20 minute baking time seemed like the perfect solution. However the recipe went wrong and I had to bake these twice, meaning that I had to go out and buy more ground almonds and dedicate much more time to the bake than I was hoping for. The majority of macaron recipes provide a weight for the egg whites used, however the recipe I was using just listed 4 egg whites. I had a stash of frozen egg whites that I needed to use up and I couldn’t remember the weight equivalent of one egg white. So I used the oracle that is google. According to Nigella, one egg white weighed 40g. I used 160g of egg whites and my almond paste was a runny batter. The finished macarons were tasty, but flat and unimpressive. After doing some more research, the weight of one egg white is more like 30-35g, so I actually used 20g more egg white than I needed. So I made these again and they tasted and looked much better than my first batch. Thank goodness. 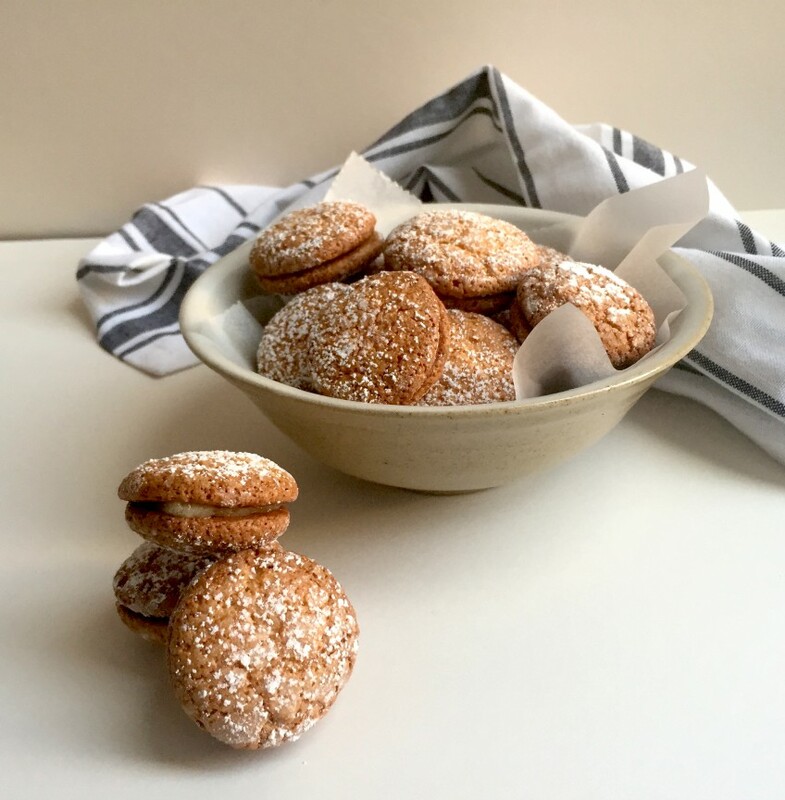 These macarons are hard to find information about, they are similar to macarons de nancy and have a crackled appearance on the surface like amaretti biscuits. Two macarons are sandwiched together with some reserved almond paste. Whilst these may not look as beautiful as their pastel coloured relations, they taste every bit as delicious. 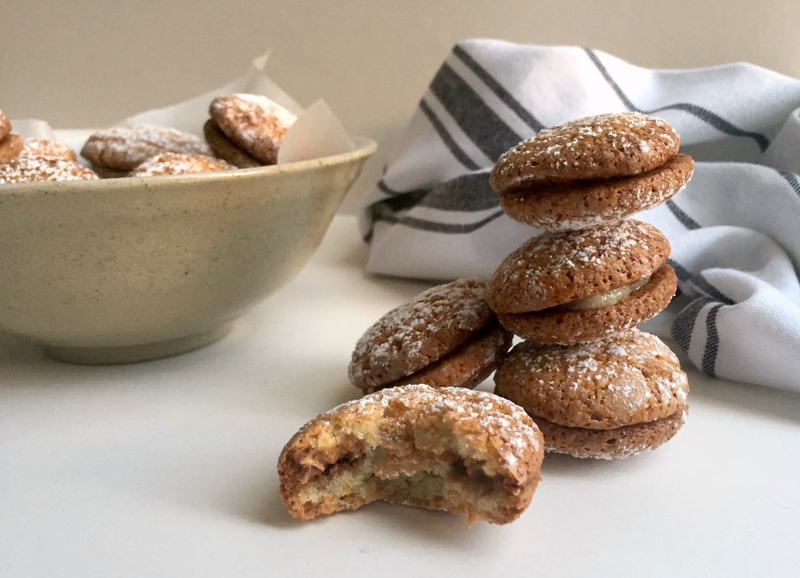 Instead of whipping up a meringue and mixing this in with ground almonds like the more well known macarons, these macarons are more of an almond paste/frangipane that is baked, this is what gives them the cracked appearance. They are then left to cool on their baking sheet while a small amount of cold water is poured underneath the greaseproof paper, this helps to keep the macarons moist as they cool. 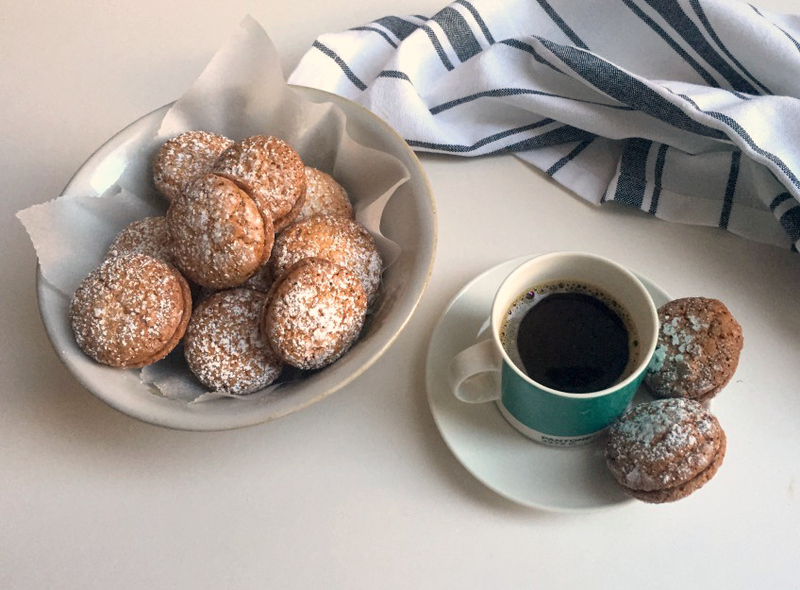 If you want to make these macarons yourself – which I highly recommend, here’s the recipe, it is really simple and these are great to have in the biscuit tin, perfect with a black coffee. 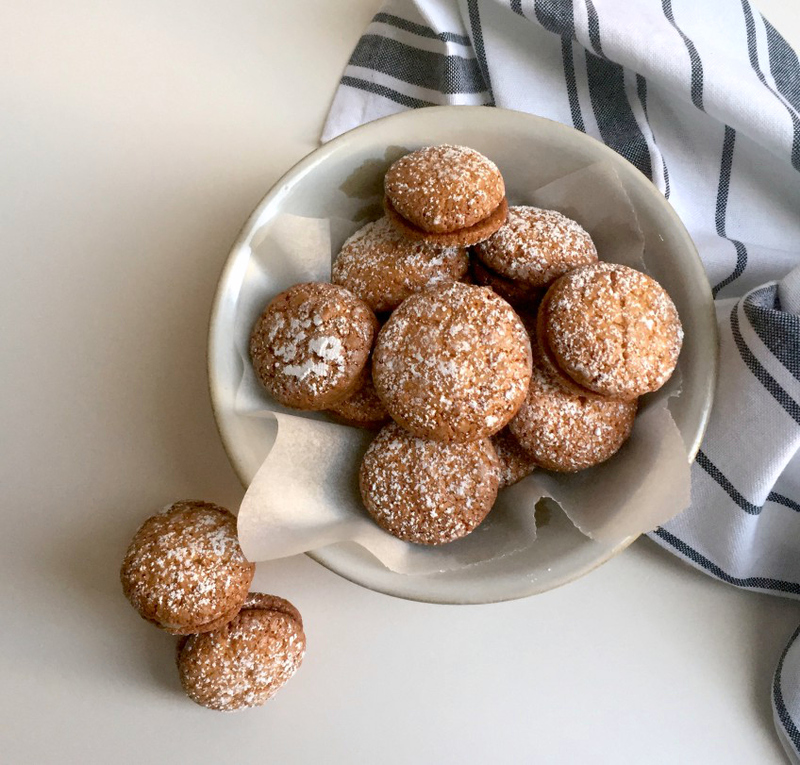 This is a fabulous recipe for old-fashioned macarons or amaretti style biscuits. In a world of pristine pastel shaded macarons, these are a welcome break. 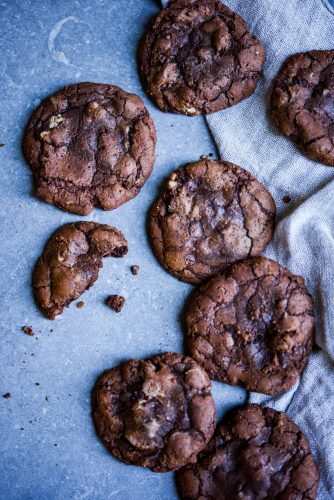 Chewy and delicious, what makes these even better is that they're meant to crack on top! Preheat the oven to 160C Fan and line 3 baking trays with greaseproof paper. Place the ground almonds, granulated sugar, honey, almond extract and egg whites in a bowl. Beat with a flexible spatula or wooden spoon to make a thick paste. Place the bowl over a saucepan filled with simmering water, making sure the water does not touch the base of the bowl. Remove the bowl from the heat and scoop out two tablespoons of the paste and reserve it. Place the remaining paste in a piping bag fitted with a 1cm straight piping nozzle and pipe 2.5cm mounds, piping 20 on each baking sheet. Dampen some kitchen roll/paper towels and lightly place them on the macarons to moisten them. Remove the paper towels and dust the mounds with icing sugar. Bake for around 20 minutes, the tops will crack, but they're meant to. Carefully pour 100ml of water underneath the greaseproof paper and leave the macarons to cool completely on the baking sheets. Transfer the macarons onto a baking sheet, so they are upside down, spread a small amount of the reserved paste onto the flat side of half the macarons and sandwich together with a plain macaron. You will have 30 macarons in total. Although I do prefer the meringue based, ganache filled extravaganza that is the usual macaron, these little biscuits are not to be overlooked. They’re so rustic aren’t they? They taste so delicious and they’re really simple to make. 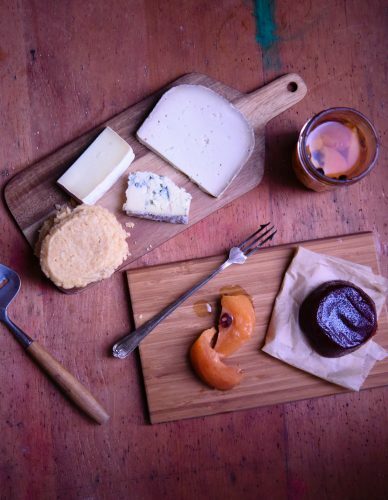 You had a cronut? That’s great, I do like them, but they’re a lot of work! Glad you enjoyed it! 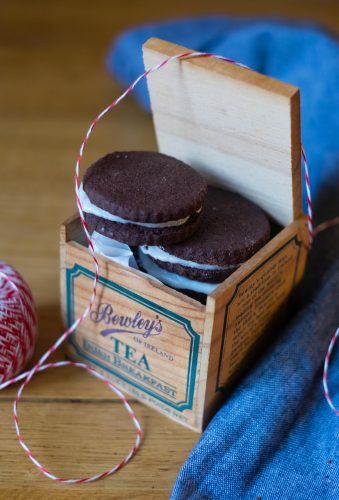 These look delicious and sound like the perfect tea and coffee biscuit! I’ve definitely been there when a rece just didn’t work out, good on you for trying them again though! 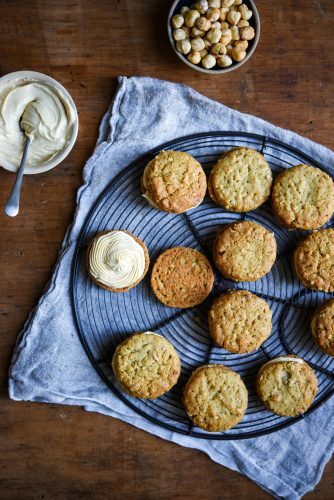 Thanks Laura – these were such an easy quick bake that I had to try them again to know how they should have turned out! I think it made it easier because I knew where I had gone wrong!